If you’re here to download the Hoshin Kanri X Matrix, you’re at the right place. But, go here if you want to learn more about Hoshin Kanri in general. 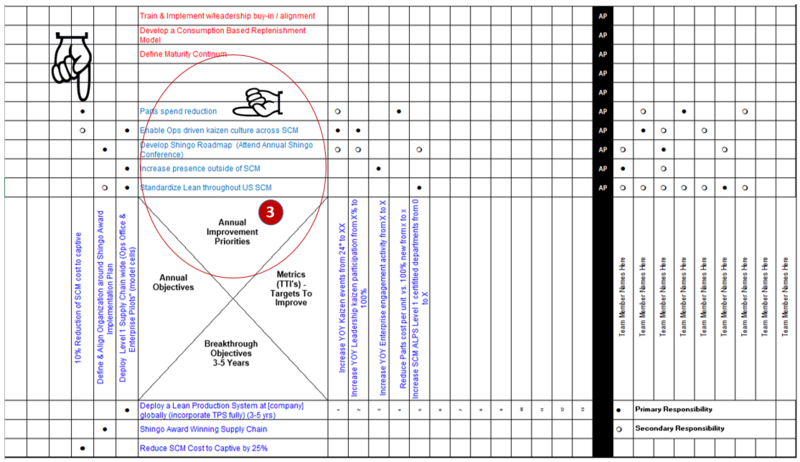 The purpose of the Hoshin Kanri X Matrix Template for Lean Policy Deployment is to develop and implement plans that are both strategic, tactical, and coordinated across people across the organization. 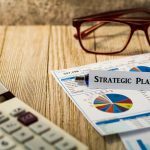 The X-Matrix also ensures there is ownership at all levels and accountability; this approach to strategic planning also encourages organizational learning, faster course corrections, and cross departmental coordination. 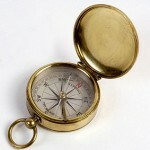 Hoshin means “shining metal pointing direction” – in other words, it’s a compass that points to True North. 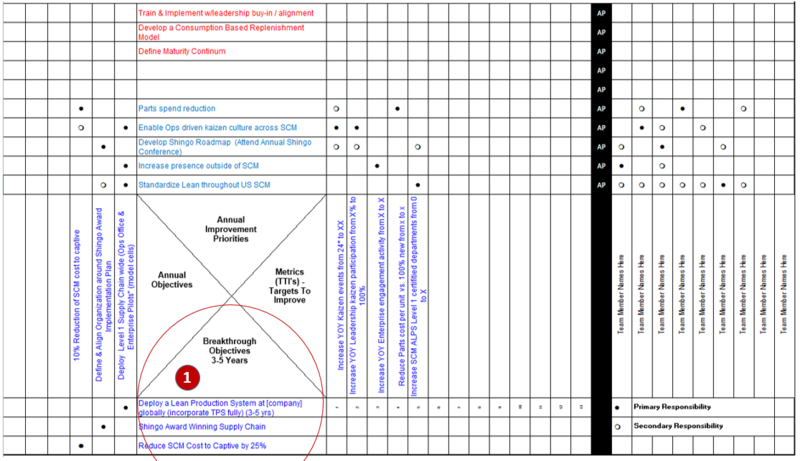 The value in the X-Matrix used in Hoshin Kanri is in the interaction between the sections. The interaction between sections will lead to better decision making. What I’m about to show is one way to do Hoshin planning – there are other ways, but what I’m about to demonstrate is pretty standard. Now let’s go through each of the sections of the X-Matrix Hoshin Kanri Template. In what follows, I’ll go through each of the main sections of the Hoshin Kanri X Template and how to complete it. Lean is fundamentally long-term thinking. Hoshin Kanri enforces this by first looking at objectives that are 3-5 years out. There can only be a few of them. In our example below, we show a few. Note that these examples are sanitized and do not represent any specific company or organization. 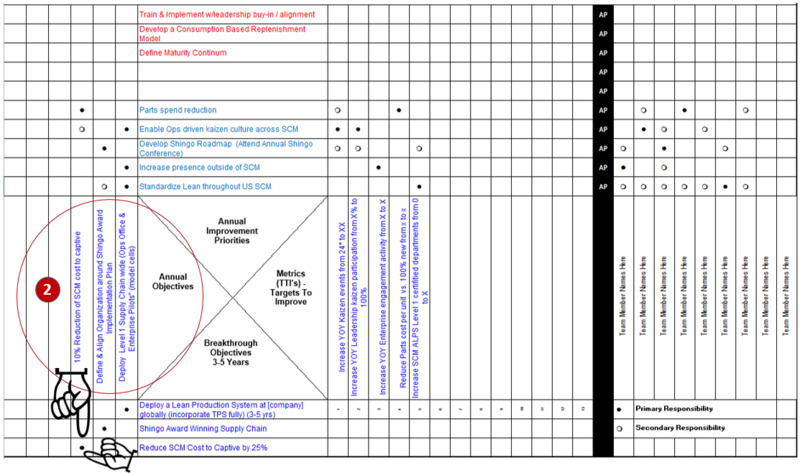 Then, we identify a few short-term (usually within 1 year) objectives that align or nests under each of the longer-term breakthrough objectives. In our example, we entered 3 short-term objectives and each of them are aligned with each of the long-term objectives. We note the alignment with a dot. Next, we want to list the specific annual, short-term improvement opportunities. 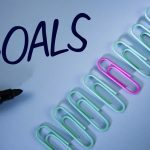 Each of the improvement opportunities should align with an annual objective and each annual objective should align with a 3-5 year breakthrough objective. 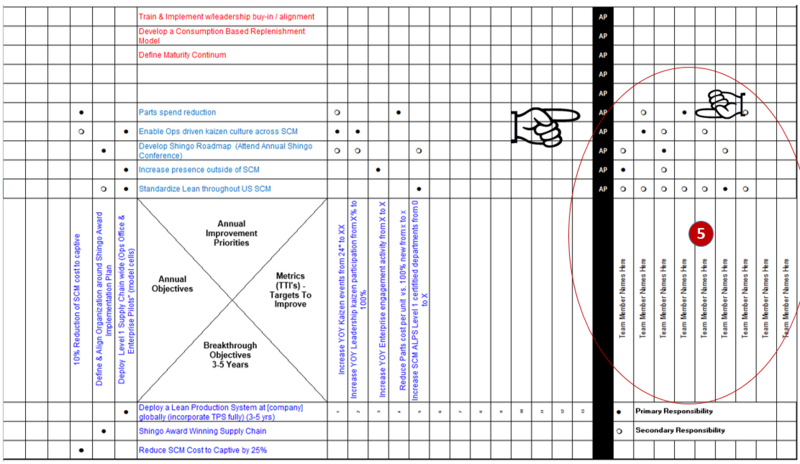 Do you see the interaction, alignment, and nesting in this type of strategic planning? In our example below, the annual improvement opportunity of “Parts Spend Reduction” is aligned to reduce “SCM spend by 10%”. Next up is completing the specific metrics we will use to measure each of the short-term initiatives, that are aligned to annual priorities, which are aligned to breakthrough objectives. Are you seeing the alignment? The nesting? The interaction? In our example below, the annual priority of “Parts Spend Reduction” is measured by the “TTI” or target to improve of “reduce parts cost per unit vs new parts of x%”. Of course none of this planning matters unless there is ownership and accountability. 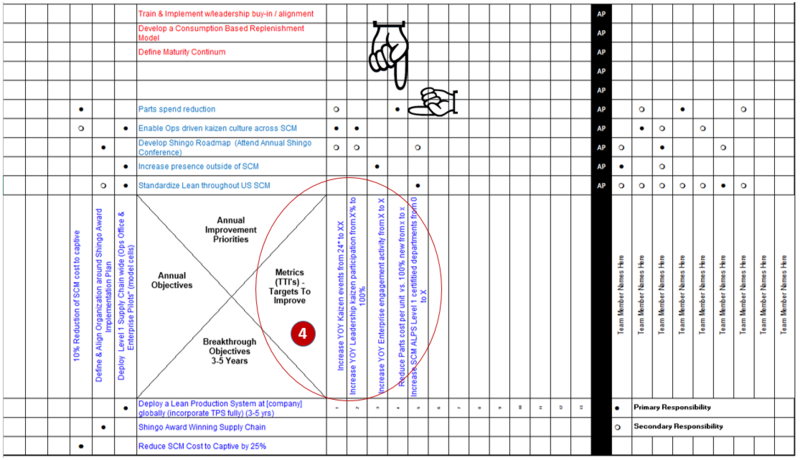 So, in the last section, you are able to complete the x matrix template by filling in the names of the accountable and responsible people for each project, metric, and objective. 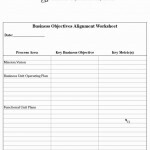 If you’d like to give it a shot or use this template in your own strategic planning, we provide a FREE download. Just click the button below and off you go. 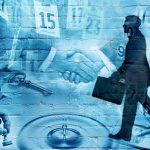 Great article and video. How would you demonstrated how the 5 yr objectives are achieved? Will there need to be xmatrices for the years to come? 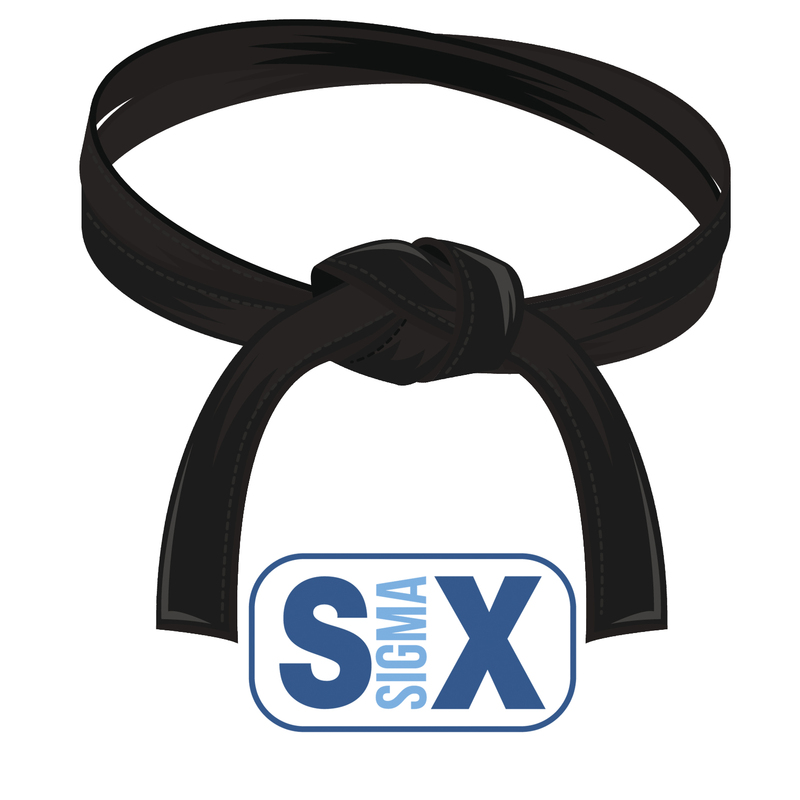 In your example for instance “Shingo award winning”, the first step for the first year is “Define and Align”. What other steps are there and how can you demonstrate (or plan) to get to that 5yr breakthrough?